Alongside the sponsorship and activations at 2 major festivals during the summer. Tourism NI were looking for additional ways to promote Northern Ireland as a weekend destination. We suggested a fleet of 2x branded Ecocabs and a branded Bug Bike targeting high footfall events during the months August and September. · 2x branded Ecocabs were used in a 30x day campaign over the months of August & September-targeting high footfall events. · Branded TNI Bug Bike was also used over 8x days targeting high footfall events including All Ireland football & Hurling finals in Croke Park.
. Passengers were encouraged to pose with one of 3x road sign props representing the 3x core NI destinations. 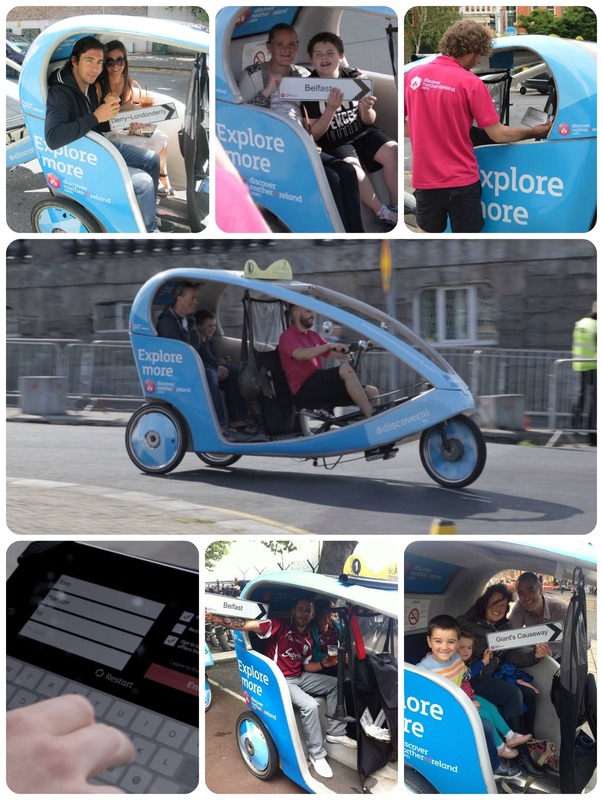 · iPad data capture process was also used inside the Ecocabs allowing us to collect passenger e-mails & have a chance to win a weekend break to one of the 3x destinations.
. Over 900 passengers engaged with Ecocabs/Bug Bike over the 30x day campaign.